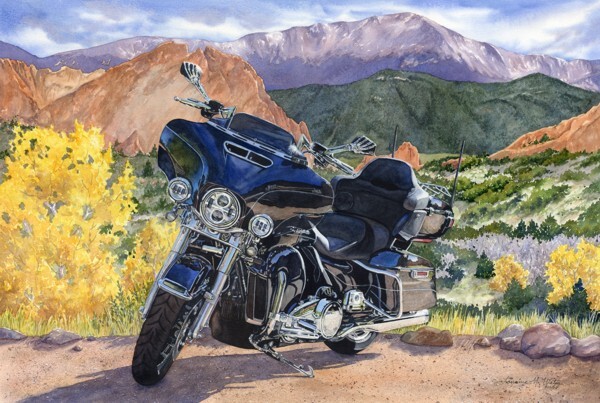 I accept commissions from clients looking for a favorite subject to be transformed into an original watercolor. However, the commission must fit with my artistic style. I work from the clients photos or if local, I will also take my own photographs of the subject for the best layout and lighting. I involve the client during the entire process. I start with a detailed sketch and a color study for approval. I require 1/3 down and another 1/3 at the time of the approval of the sketch. The first 1/3 is a non-refundable deposit to cover my time and materials. The final 1/3 will be due upon approval of the finished work of art. I work with 100% archival paints and paper, meaning your painting will be an heirloom to be enjoyed for generations. Please contact me if you are interested in commissioning an original watercolor and we can discuss the options. My prices are based $6.00 (US) per square inch of the image (not framed). Shipping will be $35 + or - depending on the size of the painting, insurance is included in the price of the painting. *The artist, Lorraine Watry, owns 'All Rights to the Artwork' unless otherwise agreed in writing. All copies, or other uses are prohibited.